When I saw the find from March 14, 2009, I was reminded of this. 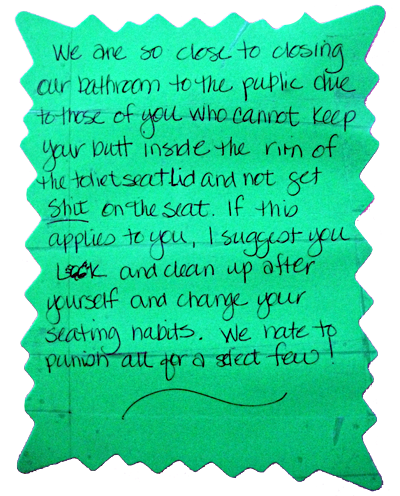 A sign next to it, written in the same style, said, “If you sit and use our bathroom ~ Please spray freshener, open window, and shut the door. Thank you.” There’s a deli in the market where delicious sandwiches are served, and the bathroom is located behind the kitchen, so I guess they don’t want the bathroom aromas to mix with the corned beef sandwich smells.